Bowing their heads to pray before digging into their delicious spaghetti lunch, volunteers who have been helping the people impacted by devastating floods in Schuylkill County were celebrated for their generosity, commitment, and courage. At this volunteer appreciation lunch, different members from a variety of Lutheran churches and networks gathered together and reflected on how they’ve helped the people of Schuylkill County repair their homes, and given them back the comfort and security they’ve always known throughout their community. 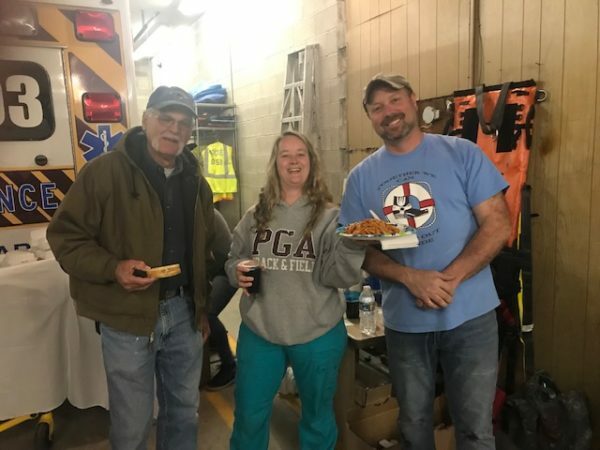 Tables were set beside ambulance vehicles as volunteers helped themselves to a homemade pasta lunch with delightful desserts and drinks in Tremont Ambulance Station. A true community effort, food, drinks, and supplies for the lunch were contributed by various members and churches throughout the local area. Speakers who thanked volunteers included Mayor Ney of Tremont, Representative Mike Tobash, Chair of Schuylkill County Long Term Recovery Committee (LTRC), John Blickley, and other local pastors and leaders. Thank you volunteers for all of your hard work and dedication to serving the people of Schuylkill County! The lunch was a wonderful representation of how different networks and churches from the community all came together to help families and individuals of Schuylkill County. Among the volunteers was Lutheran Disaster Response (LDR) Construction Coordinator, Dennis Steffy, who has helped with much of the recovery efforts within the community. Volunteers from different churches included Suzanne Schach and Pastor Mark Brooks who are also members of the Schuylkill County LTRC. Volunteer, Juan Rosado, was also in attendance as he enjoyed sharing a meal with his fellow neighbors. Juan moved from Brooklyn to Tremont about two years ago. When the floods hit Schuylkill County last August, Juan’s home was severely impacted. With water up to the ceiling of his basement, and mold spreading through to his first floor, the drywall in Juan’s house had to be completely gutted and replaced. For Juan, his main concern about the flooding was not his house, but his seven dogs as well as his neighbors. After everyone made it through the floods safely, Juan knew the recovery process would be challenging. Juan began volunteering at Kitty’s Closet, an organization started by St. John’s Lutheran in Tremont who played a major role in the recovery by providing families with food, clothing, and furniture. Debra Morano and Cathy Brown, are also key volunteers at Kitty’s Closet who were present at the lunch. Originally from Brooklyn, Debra moved to Tremont three years ago and she says she loves her neighbors like family. From the Lutheran Church of the Holy Trinity in Leesport, mother-daughter volunteers Sue and Diana Biehl, truly enjoyed having lunch with the people who have helped in Schuylkill County’s recovery. Familiar with the benevolence of volunteer work, Sue has been involved in long-term recovery work for over 14 years. Sue and her daughter have volunteered in New Jersey, Pennsylvania, and many other parts of the east coast affected by disaster. Closing out dinner with delightful desserts, volunteer Mary Frew from St. John’s Lutheran, Tremont arranged for a local Sunday school class to make goodie bags for those who attended. Baking a delicious cake and creating a beautiful banner, Mary made sure that volunteers left the lunch with full stomachs and smiles. Throughout the Liberty Lutheran family of services there are so many caring individuals who authentically and selflessly define what it means to serve others. If you’d like to develop meaningful relationships and gain insights from experiences that truly make an impact on the lives of others click here to see how you can make a difference and volunteer with Liberty Lutheran today. For residents and staff at The Hearth at Drexel, memory care is more than providing specialized services for individuals living with Alzheimer’s or dementia. It’s about providing empowering opportunities for residents to make every moment meaningful in a setting where they can nurture independence and engage with others. Dana O’Donnell, executive director of The Hearth, is extremely proud of the memory care services they provide for residents. A registered nurse with 25 years of experience in senior services, Dana has been around memory care for much of her career, and she has seen first-hand the light it can bring to the lives of both residents and their families. Dana says, much of what makes memory care at The Hearth stand out is the quality of care the staff provides for residents. “This isn’t our job. It’s our passion,” she says. Dana remembers one morning driving into The Hearth seeing a man from the maintenance team walking around their beautiful landscape with a resident from memory care. Dana says this resident and maintenance man truly enjoyed spending time together, and it was heart-warming to see that interaction. While not necessarily in his job description, this endearing memory shows how each member of staff contributes a meaningful part in providing care for residents in their own unique way. To explore more of The Hearth’s memory care services visit their website here. Inspiring Today is The Hearth’s progressive Memory Care program that incorporates their Six Domains of Living Approach, including a variety of highly personalized activities that promote fitness, spirituality, cognitive acuity, creative expression, social interaction and more. The Hearth’s team of staff takes time to learn about each memory care resident’s past routines, careers and hobbies to incorporate into their everyday lives not only within the memory care household, but outside of it as well. Keeping resident’s unique interests in mind, staff makes sure to give them experiences that bring meaning to their life and make them feel special. “We have a lot of outings, and our memory care residents will often be a part of them,” says Dana mentioning how two memory care residents went to the Phillies game earlier that day because of their love for baseball. Dana says memory care residents at The Hearth enjoy outings to the aquarium, the zoo, and all kinds of local museums. “Music therapy and pet therapy are also great activities that they really enjoy,” Dana says describing more programs that create meaningful moments for residents in memory care. Dana remembers one night at The Hearth when she stayed later than usual, “It had to be past midnight,” she recalls. She walked into the memory care household and saw three residents comfortable on the couch, watching a movie and eating bowls of ice cream. “It was just nice to see them feel at home,” she says reflecting on the experience. At The Hearth, memory care is a household model where residents experience comfort and security. “We don’t see this as an institution. We care for residents as if we were in their home because we are. This is their home,” Dana says referring to the comfort and safety residents feel living at The Hearth. At The Hearth, staff does more than simply provide quality care for residents. They give each individual the compassion and understanding that they deserve. To discover how The Hearth can help create a meaningful life for you or your loved one visit their website by clicking here. Did you like this blog post and want MORE?! Experience more stories from residents, staff, and volunteers throughout Liberty Lutheran’s family of services by clicking here! The word “home” takes on a different meaning for all of us. For some it is a place, for others it is a memory, but no matter where home is or how it changes, the word alone evokes a sense of comfort. For Liberty at Home, providing comfort and hope to patients whenever and wherever they need it is not a task, but a privilege. When Paul Butler needed home care after two separate incidents, Liberty at Home provided compassionate care that made Paul and his wife, Dotty, feel less like a scheduled appointment and more like a family they truly cared about. Liberty at Home is both a Medicare-certified Home Health Services agency, and a Home Care agency. They provide a variety of services from helping out with meals and medications to more complex support services such as skilled nursing and rehabilitation. Liberty at Home surpasses Medicare Home Health’s state and national benchmarks for quality of patient care, as well as hospitalization rates and unplanned care in emergency rooms. Paul, who received both nursing and physical therapy services from Liberty at Home can certainly attest to their outstanding delivery of quality patient care. The vibrant 82 year-old and his wife currently live healthfully and happily in the local Montgomery County area. Paul enjoys listening to opera and spending time with his grandchildren. “I have nine of them. They really keep you going,” he says enthusiastically. The excitement Paul’s grandchildren bring into his life is evident along with his pride for all of their accomplishments. “We’re headed to Wilkes University this weekend to watch my grandson’s lacrosse game. He’s one of the top ranking players for goals scored in division three!” Paul exclaims, his voice beaming with pride. When the vivacious and proud grandfather fractured his knee two years ago, Paul’s doctor referred Liberty at Home and they provided physical therapy services. “They set me in the right direction and prevented me from needing surgery,” he says. Paul and Dotty were so happy with Liberty at Home that when Paul was sent to the hospital almost a year later for a separate medical incident and needed home-care once again, they knew Liberty at Home would be there for them. Living up to their well-earned reputation, Liberty at Home provided Paul and his family with the compassionate care they needed. Paul says what he appreciates most about their care is the way the nurses and staff were genuinely interested in how he was doing. Dotty admired the kindness she and her husband received from the Liberty at Home nurses, “It wasn’t ‘Okay do your exercises and on to the next patient.’ They truly cared about us and took the time to ask how we were doing.” Using Liberty at Home’s services on two separate occasions, the Butlers will always appreciate the care they received. If they ever need home care again, the Butlers are confident Liberty at Home will be there for them. What should patients know about home health? Executive Director of Liberty at Home, Anna Marie Daley, has been working in home health for nearly ten years. As a registered nurse starting in the field, Anna Marie has seen Liberty at Home grow from just a few patients to over 100, and although she’s taken on a new role since then, she says home health will always hold a dear place in her heart. Anna Marie wants patients to know that they have a choice when it comes to home health care and that research will help them find the agency that’s right for them and their unique medical needs. By using Medicare’s Home Health Compare website you can compare different home health agencies in your area based on ratings and services provided. Ranking 4.5 out of 5 stars, Liberty at Home surpasses other home health agencies in managing daily activities, managing pain and treating symptoms, preventing re-hospitalization, and preventing unplanned hospital care. In addition to their outstanding ratings for quality of patient care, Liberty at Home earned accreditation by the nationally- recognized Accreditation Commission for Health Care. The agency’s commitment to quality services and optimum care stems not just from what they do, but how they do it. Not to brag, but check out Liberty at Home’s outstanding ratings for yourself! Click here to view them on Medicare Home Health Compare. If you’re looking for home-care agencies that treat patients like family, see how Liberty at Home will be there for you and your loved one. Liberty Lutheran greatly appreciates the work and dedication of volunteers each and every day, and this week we are especially grateful. At Liberty Lutheran family of services, the word volunteer means so much more than simply serving others. As our volunteers selflessly dedicate their time to serving residents and families throughout our communities, the experience of giving back opens their eyes and their hearts to the extraordinary power of kindness and compassion that motivates us all. For Chris Leauby, volunteering at Artman has been a deeply impactful experience for both him and the community. Holding a special place in his heart, Artman was home to Chris’s mother for two and a half years. He enjoyed spending time with his mother at Artman, and he will always remember the compassionate care she received from staff. Chris’s mother passed away in late March and while he is forever grateful for the care and support Artman gave to him and his family, Liberty Lutheran is equally grateful for his dedication and volunteer work that largely benefits the Artman community in so many ways. Chris’s volunteer work for Artman began as he spent more time there visiting his mother. He learned about the Artman Golf Committee and was very excited to get involved. Chris enjoys his meetings with the Golf Committee as they plan fundraising events year-round for the community at Artman. “It’s really a great group of people. There’s a nice mix of Artman staff as well as residents’ families. Some people from my church, The Upper Dublin Lutheran Church, are involved as well,” Chris says, describing the kind-hearted people who make up the Golf Committee as well as his shared connections. The Committee’s volunteer efforts are certainly gearing up as they prepare for one of their largest events happening this spring. This year, the 35th Annual Artman Golf Outing takes place on May 20th at the beautiful, championship caliber golf course at Bluestone Country Club where all proceeds will benefit the Artman Benevolent Care Fund. Already helping to organize fundraising events leading up to this occasion, like the first-ever Artman Designer Handbag Bingo, as well as dining experiences at local restaurants, it is volunteers like Chris as well as many others who are an essential part of what makes fundraising events like this so successful year after year. In addition to their preparation for the Golf Outing, Chris and The Committee are working to plan a fun-filled “Painting with a Twist” this summer, where attendees will get to fully express their creativity on canvas. Outside of the Golf Committee, Chris enjoys volunteering with a few friends musically by delivering happiness to residents at Artman through song. The support from volunteers like Chris is vital to the residents, families, and staff throughout Liberty Lutheran’s family of services. We appreciate our volunteers who not only define what it means to selflessly serve others, but who go above and beyond to support our mission every day. There is a world of opportunity for you to get involved and deeply impact the people of our community. If you’d like to give and make a difference, volunteer with Liberty Lutheran’s family of services by visiting our website and clicking here. We all aspire to have balance in our lives. For adults approaching their later years in life, achieving balance physically is especially important. Balance exercises can help improve stability and decrease your risk of falling, which for older adults can be a key component to staying healthy and living well. For Fitness Director of The Manor at York Town, John Miller, balance exercises are a great way to make sure his clients stay upright and strong. He’s here to share his tips on the best balance exercises for you! Balance exercises you can do anywhere! For safety, you may want to have a wall or piece of furniture nearby to lean on for added stability. Stand with both feet on the ground with a stepping stool or stair in front of you. Slowly lift one foot and tap it on the step. Return your foot back to standing position. Repeat this 15 to 20 times. Then switch and repeat the same steps on the other foot. Have a chair in front of you to lean on if you need it for safety. Begin by standing with both feet on the ground hip-width apart. Lift one foot six inches off the floor and balance on your planted foot without leaning. Hold for ten seconds and repeat on the other leg. If ten seconds is too challenging, start with five. When ten seconds becomes easy, try to hold your balance longer on each leg. Stand on one side of the room with your feet hip-width apart. Turn your head to look over one shoulder. With your head still turned, take a few steps forward slowly. Then turn your head to look over the other shoulder and take a few more steps forward. Repeat this five times on each side. Place one foot in front of the other, touching the toe of one foot to the heel in front of the other. Stay like this for two minutes. Try not to lean. John’s history with fitness is certainly strong. Having a natural interest in nutrition and a love for gym class since high school, John knew fitness was his future. Shortly after his high school graduation, John earned a black belt in Karate and became a Karate instructor for six years. He was simultaneously working as a fitness trainer at local gyms and as he became bigger and stronger, John easily found his way into the world of power lifting. Placing second in the AAU Nationals for power lifting, John quickly recognized his talent for the sport. Unfortunately, when he made it to the AAU World Championships competition he tore his quadriceps tendon and injured himself quite badly. Out of work for nearly a year, John decided this was the perfect time to get his certification in fitness and nutrition. After obtaining his certification from the American College of Sports Medicine (ACSM), he worked in different hospitals and was fascinated with the inner workings of the human-body. Improve your balance and live well at The Manor at York Town. The Manor at York Town, a premier independent living community located in picturesque Bucks County, is the perfect place to get the help you need to regain your balance and kick start your wellness. If you want to live your best life and stay strong and healthy, find out how The Manor at York Town can help you by visiting their website here! One of the most meaningful gifts that we can provide our loved ones is the knowledge that we care for them. This gift endures in memory even after life journeys end. In 2018, Liberty Hospice expanded their offerings to the families of patients through a new service that helps that memory live on. Now, with the help of a local seamstress, Liberty Hospice is able to offer teddy bears and pillows that are created by using clothing that once belonged to patients. Upon initial research, the team at Liberty Hospice found that similar freelance services existed, however production costs usually started at around $65 per item. The Hospice team knew they could do better. To ensure a personal touch, Liberty Hospice works with family members to add elements to pillows and bears, which may be emblematic of their loved one. This has included adding special buttons and broaches to pillows, or adding features to bears such as aprons or a string of pearls.